A.A. Bin Hindi Group and KIA Motors handed over cars to the lucky winners of Shop Bahrain’s weekly raffle draws at KIA’s Showroom in Sitra. The event was attended by organizers of Shop Bahrain, the largest shopping event in the Kingdom and Bin Hindi Motors’s officials. Bin Hindi Group and KIA Motors joined Shop Bahrain as one of the Festival’s strategic partners, which was launched on 1 January and ran till 2 February 2019. The partnership came in line with the Bin Hindi Group’s commitment towards supporting the Kingdom’s initiatives which contribute to the development of the tourism sector, as well as strengthening relations between the public and private sectors to achieve the Economic Vision 2030. 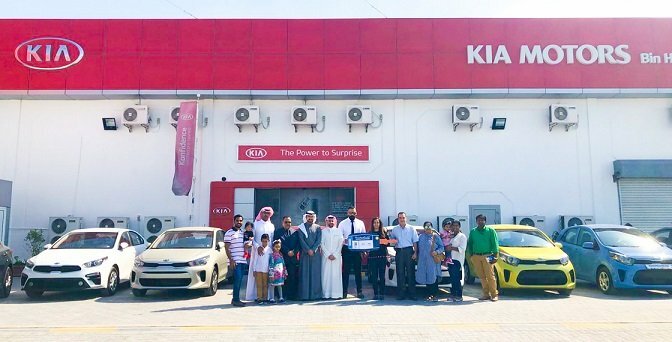 Under its partnership with Shop Bahrain, Bing Hindi Group and KIA Motors gifted 11 cars to winners of the weekly raffle draws which were held throughout the Festival. Bin Hindi Informatics – the authorized distributor for Samsung, and a subsidiary of the Group, also joined Shop Bahrain as a Platinum Partner offering electronic devices among thousands of instant prizes. Shoppers with receipts worth BD 50 or more had the chance to win one of over 73,000 prizes. Shop Bahrain mirrors the Kingdom’s position as an ideal family tourist destination, renowned for its close proximity to the Gulf countries with easy access through the King Fahad Causeway and the Bahrain International Airport. Shop Bahrain, the largest shopping festival in the Kingdom, aims to stimulate the tourism and retail sectors by showcasing Bahrain as an accessible and welcoming destination for families and offering a unique and fun-filled experience with many valuable prizes to be won. The Festival ran for 30 days starting from 1 January to 2 February 2019.